You’ll lose everything — This is a common fear for folks considering Chapter 7 liquidation. True, the bankruptcy trustee takes possession of your non-exempt property and sells it to partially satisfy your creditors. But the law exempts certain dollar amounts of various categories of assets, and exempted property does not become part of the bankruptcy estate. To protect your house, Florida has one of the most generous homestead exemptions in the country. But, if you don’t use the homestead exemption, you can use a wildcard exemption to keep up to $4,000 in personal property. Bankruptcy wipes out all debts — Unfortunately, many categories of debt are not dischargeable. These debts include recent taxes, unpaid alimony and child support, and student loans (except under extreme circumstances). Also, if you ran up a lot of debt immediately prior to filing for bankruptcy, the court may view that as an attempt to defraud the lender and deny you a discharge even if the debt belongs to an eligible category. Your credit rating is ruined forever — Bankruptcy certainly looks bad on your credit report for a couple of years. But discharging your debt has a positive effect, and you can start to rebuild your credit by taking out a high-interest, low-limit credit card. By paying off your balance every month, you avoid interest charges and start to rebuild your credit. You should be able to get a secured loan for a car within a short time and even apply for a mortgage within a few years. 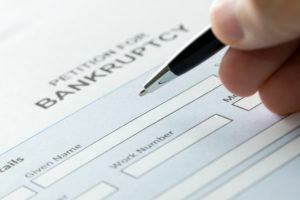 Bankruptcy is for deadbeats — Although a certain amount of social stigma once attached to bankruptcy, the law is intended as compassionate relief for honest but unfortunate debtors. As a society, we have decided there’s nothing to be gained by keeping our fellow citizens trapped in a miserable existence, bound to financial obligations they can never hope to repay. America believes in second chances to make good, and bankruptcy is a tool to achieve that end. It’s always better to pay off your debts — This is an idealistic rule, but like almost any absolute statement, it doesn’t fit all realities. Think of debt for a moment as a contract. Say, you signed an agreement to build a bridge for a certain price. But shortly after you signed the papers, the price of steel and concrete doubled due to circumstances beyond your control. Now, if you order the supplies and build the bridge, you will lose twice what the contract is worth. Are you obligated to fulfill the contract? No, you can breach the contract and settle with the other party for damages. That’s basically how bankruptcy works. Rather than slave to pay interest on a balance that never goes down, you can liquidate your assets, repay a portion of the debt, and be free of the crushing obligation. At Law Offices of Carol M. Galloway, P.A., we want you to find the debt relief solution that works best for you. Because we want you to be guided by facts, not myths, we provide the information you need to make an educated decision about your future. If you’re wondering if bankruptcy is right for you, call our firm at 904-356-7005 or contact us online to arrange your consultation.